The first task is to wind the window down fully! Then remove the window winder handle by prising it off with a screwdriver. Now remove the lock handle surround as shown on the left. With the trim removed, disconnect the speaker wires. Now you need to remove the door-lock retaining clip by dislodging it with a screwdriver. Please note that this will not be replaced when re-assembling. 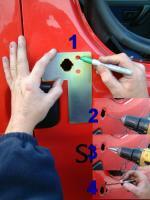 Placing the zinc-coated plate over the door-lock hole as shown in the photograph and mark the door for drilling. Please note that because the door is double-skinned, you will need to drill a pilot-hole before using your larger drill-bit Once you have completed the drilling, protect the area by applying a small amount of touch-up paint to the drill holes..
Having drilled the holes, you can now prepare to fit the plates. First of all apply the rubber gasket to the back of the stainless-steel frontplate and apply a small amount of silicone around the threaded studs. You can now attach the stainless-steel frontplate and secure it with the supplied Nyloc Lock-Nuts. Once the Nyloc nuts are tightened (do not overtighten), then you simply need to check the alignment of the keyhole and if necessary, gently tap the plate with a soft-faced mallet.